Weddings Decoration Ideas, DIY Creative Tips, Cheap Weddings Flowers, Green Eco Friendly, Decor Ideas Candle Lights. Indian and Indian-themed weddings are popular among Indians and non-Indians alike, largely because of their vibrant and colorful atmosphere. Well-chosen Indian wedding decorations can help enhance the festive and celebratory mood. Indian weddings typically feature bright colors such as orange, red, yellow, green and blue. The most popular color combination is gold and red. Drape bright Indian saris across the room for a rich and luxurious look. 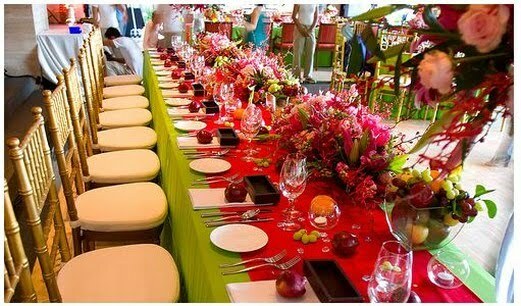 Choose table cloths in vibrant shimmery material and decorate chairs with brightly-colored cushions. Place large silk and gold embroidered cushions on the ground for guests to sit on and relax. 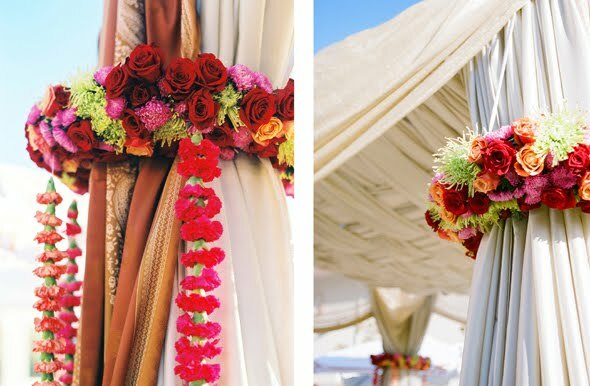 Another staple of Indian weddings is a garland of flowers hung from every corner of the room. String together red and white carnations and hang them in scallops from one corner of the room to another. For table centerpieces, choose brightly-colored flowers such as orange lilies, purple orchids and double-delight roses to create striking floral arrangements. Place party favors, such as little truffles or chocolate, in silk- and sequined-covered miniature boxes. You also can pass out coasters or tea lights decorated with Indian motifs. For female guests, it is also fun to distribute enamel and gold bracelets. These inexpensive bracelets can be bought at Indian clothing stores. 1 Response to "Tip for Indian Wedding Decoration Ideas"
OMG!!! It looks so beautiful. Would like to use these kind of ideas in near future.